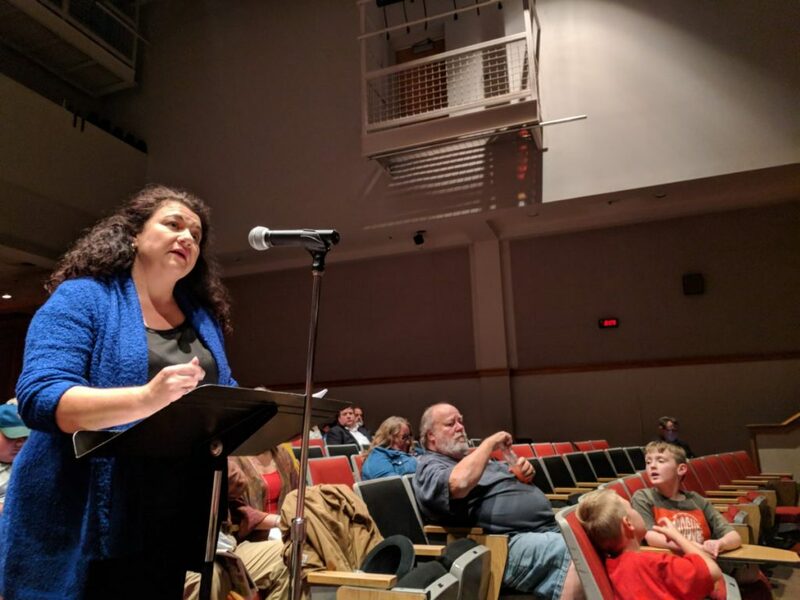 One evening this past November, angry customers and public officials filled a high school auditorium in Hazard, Kentucky, and took turns pleading with three members of the state’s public service commission. 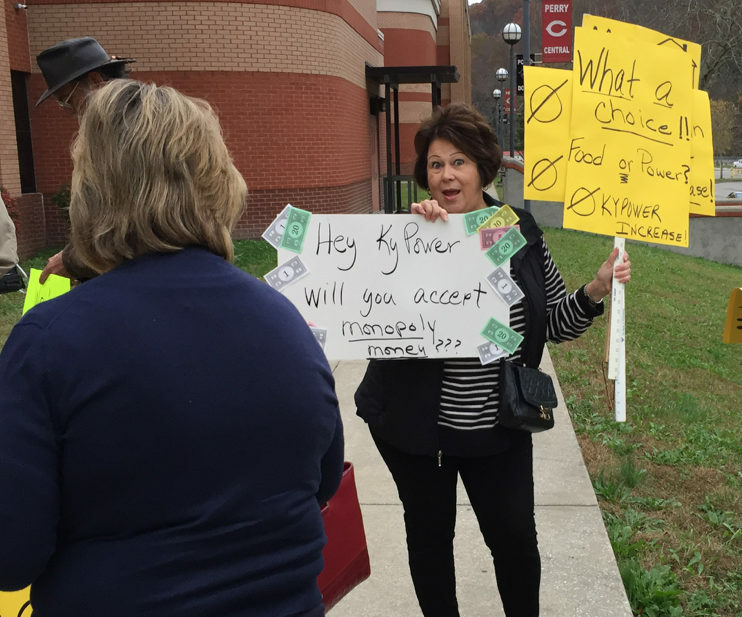 Hatton was one of dozens who came to the hearing to voice opposition to the roughly 15 percent rate increase requested by Kentucky Power, a branch of American Electric Power. Hatton says power rates are by far the topic she hears about most from her constituents. She says it’s the topic of 80 percent of the emails she gets, and the main issue she hears from business owners. “They can’t afford to stay in business,” Hatton said. “That’s not going to help us get back out of this terrible situation with the downturn in the coal industry here. Kentucky Power serves a region that’s lost a lot people and businesses in the last few years. The company’s President and COO, Matthew Satterwhite, defended the rate increase as necessary to make sure the company remains profitable enough to attract investors. Satterwhite said the company has invested heavily in recruiting new businesses, and he’s optimistic that the economy is turning around. But many at the hearing were worried that increased prices could feed a vicious cycle of economic collapse and population decline. The Ohio Valley region has historically had among the lowest power rates in the country, a benefit of the region’s legendary coalfields. That’s still true, but maybe not for long. The coal industry’s downturn is contributing to rising power rates in more ways than one. Even in areas with more stable and prosperous economies, power companies are facing challenges. The once reliable trend of increased demand, decade after decade is giving way to a new energy landscape. In the last few years demand has remained pretty flat. Cathy Kunkel is an analyst with the Institute for Energy Economics and Financial Analysis, a research group that promotes sustainable energy. She explained that the recent recession, together with increasingly efficient homes, appliances, and light bulbs, have meant that business for power companies isn’t growing as steadily. And here in the Ohio Valley region, there’s another challenge. “There’s also a problem with our utilities having made investments in a lot of coal-fired power plants and those investments not turning out to be competitive anymore,” Kunkel said. Coal is no longer the cheapest source of energy. It’s been passed by natural gas, and renewables aren’t far off. 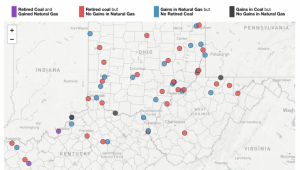 While there has been a regional shift among utilities moving from coal to gas to turn turbines, Kentucky Power, like many utilities in the region, is still very much invested in coal. And that’s part of why they’re in a situation where they’re requesting higher prices. Kentucky and West Virginia laws guarantee a certain amount of profit to regulated power companies, which lets them pass costs on to customers. These are companies that operate as a local monopoly. Their prices are set by state commission, through formulas that guarantee a certain amount of profit. Power companies in unregulated markets would have to stomach the losses from bad investments in coal power themselves, but if they can sell or transfer coal-fired power plants to regulated markets, then they can argue that their higher costs require a rate increase, letting the burden fall on their customers. 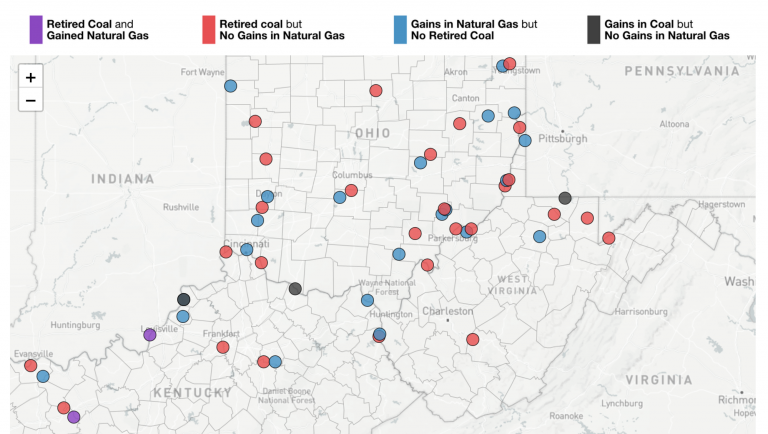 Power companies are far from alone in betting on coal, and getting burned. The jobs and tax revenue that coal once provided are shadows of what they used to be. Throughout the coalfields, budgets have tightened at every level . At the hearing in Hazard, Rose Wolfe described the situation she sees in Jackson, Kentucky, where she serves as mayor. She told the crowd and the commissioners that she’s seen many people having to make hard choices between power, food, and medicine. She’s explained that for seniors drawing just over $600 a month, power bills regularly take up between a third and a half of their come. She received cheers and applause when she told the crowd she wants Kentucky Power to share part of the burden. The Kentucky Public Service Commission is expected to issue a decision about the proposed Kentucky Power rate increase by the middle of January.